Find the font used, erase spelling mistakes, retype with correct font? And if you can't find the right font manually copy/paste other letters from the document. auto filling on paist, no idea how to stop it. I don't understand. Could you send a screenshot? How do I change the amount of pixels? Go to Image -> Canvas Size or press CTRL+Shift+R. Then it will ask you how big you want the image to be. http://sourceforge.net/projects/abrviewer/ I think? I don't use it but apparently it's .NET 3.x compatible. 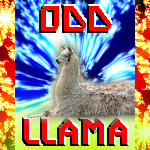 OddLlama replied to pyrochild's topic in Plugins - Publishing ONLY! Thanks for the positive feedback I added another image. Yay! I have a gallery now! Apparently I'm too lazy to put more stuff so it has three images! Link to gallery on my website Click any image for full size. More coming soon I guess. Constructive criticism welcome! That sounds like a great idea! There will have to be some judging/ruling/stuff on whether the component was altered too much though. Great start to your gallery! The first image full-size looks like it really came from the star wars movie Looking forward to seeing more of your work! I'm the Forum Troll of 2012? Ah, I didn't see that thread. Which posts of mine are trolly? I'm pretty sure most of them are trying to help other people new to Paint.NET. (Don't take away my title though, I like having one ) Anyway, yay for new year's fun.